Get professional Opinion and Treatment about your Rotator Cuff Tendonitis. Effective and fast relief treatment by Experienced Shoulder Specialist. Call us +65 97731458 to schedule for an appointment. 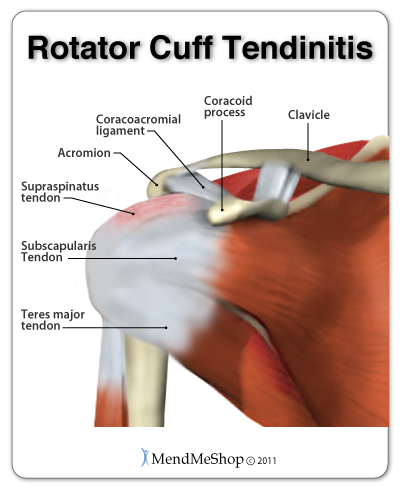 Rotator cuff tendonitis is an inflammation (irritation and swelling) of the tendons of the shoulder. The shoulder joint is a ball and socket type joint where the top part of the arm bone (humerus) forms a joint with the shoulder blade (scapula). The rotator cuff holds the head of the humerus into the scapula. Inflammation of the tendons of the shoulder muscles can occur in sports requiring the arm to be moved over the head repeatedly as in tennis, baseball (particularly pitching), swimming, and lifting weights over the head. Chronic inflammation or injury can cause the tendons of the rotator cuff to tear. The risk factors are being over age 40 and participation in sports or exercise that involves repetitive arm motion over the head (such as baseball). Weakness with raising the arm above the head, or pain with overhead activities. How to diagnose Rotator Cuff Tendonitis? X-rays may show a bone spur, while MRI may show inflammation in the rotator cuff. An MRI can show a tear in the rotator cuff. What is the treatment for Rotator Cuff Tendonitis? Treatment involves resting the shoulder and avoiding activities that cause pain. Ice packs applied to the shoulder and nonsteroidal anti-inflammatory drugs will help reduce inflammation and pain. Physical therapy to strengthen the muscles of the rotator cuff should be started. If the pain persists or if therapy is not possible because of severe pain, a steroid injection may reduce pain and inflammation enough to allow effective therapy. If the rotator cuff has had a complete tear, or if the symptoms persist despite conservative therapy, surgery may be necessary. Arthroscopic surgery can be used to repair some tears and remove bone spurs and inflamed tissue around the shoulder. Some large tears require open surgery to repair the torn tendon. Posted in Shoulder Pain and tagged rotator cuff, rotator cuff injury, rotator cuff pain, rotator cuff tendinitis, rotator cuff tendonitis, rotator cuff treatment, shoulder injury clinic, shoulder pain clinic, shoulder pain specialist, singapore shoulder pain clinic.